Physical and Spiritual Health: Do we have the right to know what's in our food? Do we have the right to know what's in our food? Yes, we all have the right as consumers to know what is in our food. I have googled about label GMO and learnt that 50 countries with over 40% of the world's population already label GMO foods. It's high time for other countries to follow suit to give consumers the right to know what's in their food, especially since there are studies that show GMO foods may pose health risks in the long run. I learnt that in Singapore there are no such laws requiring GMO foods to be labelled as such, and the authorities appear to be dragging their feet about it, citing economic concerns, which is not really surprising since they appear more worried about companies making profits than people's health and well being. 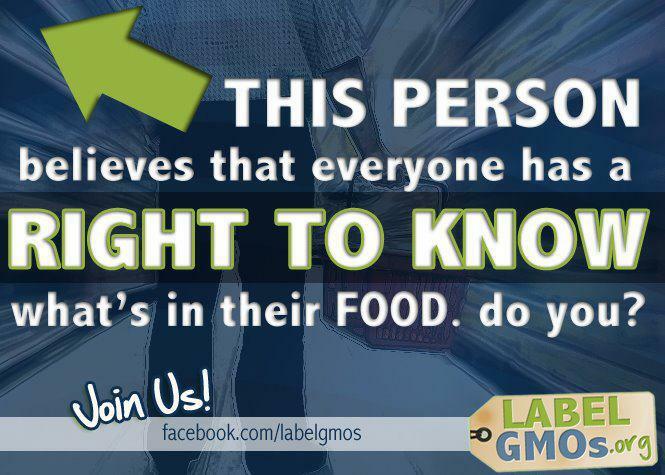 I will see what I can do to help spread awareness on the need for more people to know what is in our food too. I also learnt that while there is no GMO label on foods in Singapore yet, there are some foods that have non-GMO labels, as mentioned in a forum. "Haha, well it's true that in SG there is no ruling that you can't use GM food. However, you cannot label your product as Non-GMO unless it is true. If you want to be on the safe side, look for foods with labels that state Non-GMO. Also for your reference, Europe is not the only country with strict Non-GMO rules. Japan, Hong Kong, Australia and even Thailand is very strict with that." So, at least I can choose to buy foods that are certified organic or labelled non-GMO, which are safer and healthier. I have also stopped buying canola cooking oil some time ago after reading about its side effects due to it being genetically modified. I have switched to other kinds of cooking oil instead. "Not all of us can eat 100% non-gmo every single day, but all of us can manage to do one day a week with some efforts. Shoot for the moon, but never forget that every little step you make counts." Yes, each of us has the power to make a difference. Like what Helen Keller said,"I am only one, But still I am one. I cannot do everything, But still I can do something;" So just like each of us can save the environment through making adjustments in our own lifestyle, I can also do my part in not supporting GM foods and the companies that produce GM foods by choosing to buy organic and/or non-GM foods wherever I can. Every little step counts indeed, not only for the good of the environment, but also for my own health. What is Total Body Modification? Where does canola oil get its name from?